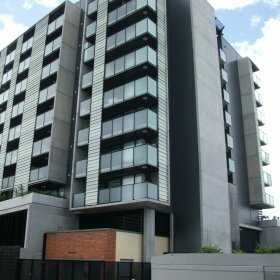 Situated at the corner of the new Green Square development on Constance Street in Fortitude Valley this new award winning building built to Green Star standards and designed by Cox Rayner Architects provides designer quality affordable housing for low income workers. 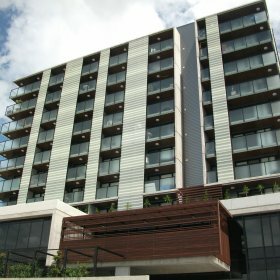 The 10 storey building with a single level of basement cut into Brisbane Tuff (rock) houses the Sir Thomas Reginald Groom Place and Maida Lilley Community Centre on the lower two storeys with the remainder providing 80 affordable housing units. A large open atrium area is present throughout the 8 residential levels providing a sense of community throughout the building along with natural light and ventilation. Lambert & Rehbein were engaged to provide Structural and Civil Engineering services for the design of this project. The building is supported on reinforced concrete pad footings, founded directly into the rock with the basement car cark formed as a slab on ground. 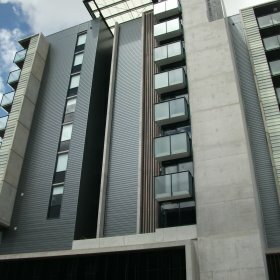 The upper floors, from level 2 up to the roof are formed as reinforced concrete floor slabs supported on a series of precast concrete walls and columns with non-loadbearing masonry party walls between the units. Ground and level 1 floor slabs were constructed using post-tensioned concrete to allow for increased spans through these areas. A steel roof frame is located directly over the atrium space and supported on steel columns fixed back to the roof slab.